RARE VERY FINE 1st Edition, 1st Printing. Of'Walt Disney and Assorted Other Characters' Signed by author & late Disney Legend. Long Out of Print Book'the perfect gift for that Disneyana Collector. Jack Ryan Kinney (March 29, 1909 February 9, 1992) was an American animator, artist, director and producer of animated shorts. Kinney began his long career in cartoons at the Disney Studios in 1931 as an animator on several shorts, including Santa's Workshop. (released on December 10, 1932), The Band Concert. (released on February 23, 1935), and Moose Hunters. (released on April 17, 1937). He then became a director of cartoons at Disney, including as a sequence director for both Pinocchio. And especially as a director in the shorts department, where he directed many cartoon shorts, mostly those starring Goofy. Created the stories for the shorts, although he also directed a few Donald Duck cartoons as well, including the Academy Award-winning wartime propaganda film, Der Fuehrer's Face. He also served as director of most of the "package films" during the 1940s, including The Three Caballeros. And The Adventures of Ichabod and Mr. In the mid-1950s, he supervised new animation used to tie some of the old shorts together for Disney's television efforts. In 1957, after Kinney left Disney he started, with another Disney alum, Hal Adelquist, Kinney-Adelquist Productions, Inc. Among other work they provided animation for King Features Syndicate's 1960 Popeye. Kinney also directed the 1959 UPA. Walt Disney and Assorted Other Characters. In 1988, Kinney published a memoir, Walt Disney and Assorted Other Characters: An Unauthorized Account of the Early Years at Disney's. A wonderful account of Kinney's 26 years at the Disney Studio, which offers the insider a rare glimpse into the day to day workings, recreation time and varying personalities (along with certain nuances) of the employees employed by Walt. It is both humorous and unabashedly revealing in the varying highs and lows of what made the studio run on a daily basis. Walt's persona is perhaps revealed as in no other publication, although certainly not in a mean-spirited manner. The book is warmly endorsed on the back of the Dust Jacket by the likes of such immortal animators, authors & editors as Walter Lantz, Frank Thomas & Ollie Johnston, Bill Hanna, Shamus Culhane, John Canemaker and Mike Barrier. NOTE: ALL of our framed cels, watercolors, signed books are. 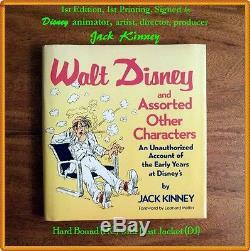 The item "RARE 1st Edition Walt Disney & Assorted Other Characters SIGNED by Jack Kinney" is in sale since Sunday, November 9, 2014. This item is in the category "Collectibles\Disneyana\Contemporary (1968-Now)\Books". The seller is "fashiontime" and is located in Uniontown, Ohio. This item can be shipped worldwide.